Don’t Like Being a Guinea Pig? Opinion 7304 To The Rescue! 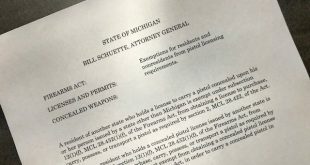 Keith Finch July 11, 2018	Featured, Michigan Gun News, News Comments Off on Don’t Like Being a Guinea Pig? Opinion 7304 To The Rescue! Keith Finch July 5, 2018	Featured, Michigan Gun News, National News, News Comments Off on Don’t Like Being a Guinea Pig? Opinion 7304 To The Rescue!